The CWRU Film Society reviving the original ALIEN cues - owww! - flashbacks to my college film society back at Syracuse University. Yes, I went to college out of state; it didn't help in the job market after all, if you were wondering. 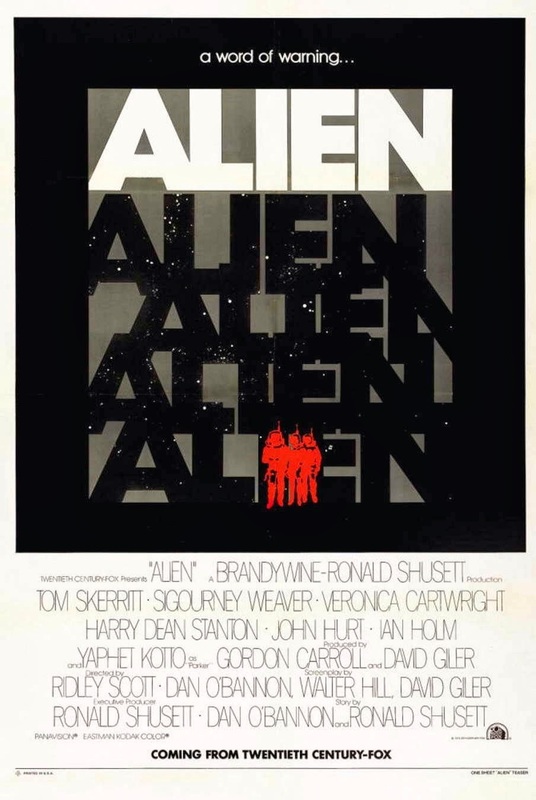 Back in my undergrad days seemed like the Syracuse University student film society practically played ALIEN as often as they could. Typically in heavy rotation with whatever else was deemed college-cool in the 1980s, usually stuff scrounged up from the catalog of Rainer Werner Fassbinder and Werner Herzog. The hipster programmers did enjoy the gory and the grotesque. Ridley Scott's 1979 gothic ALIEN is not as original as its trendsetter status would suggest; Scott and writer Dan O'Bannon borrowed liberally from a clawful of other SF movies (a little bit here from Mario Bava's PLANET OF THE VAMPIRES, a little bit there from the B-matinee fave IT! THE TERROR FROM BEYOND SPACE). And after this film's monetary success a quiet payout went out from Fox to offended author A.E. Vogt, whose short story "Black Destroyer" was a bit similar as well. But the ALIEN-ators polished their thievings to a high gloss of morbidity, with production designs, spaceships and props inspired by Metal Hurlant (the original European Heavy Metal magazine) illustrators Moebius (who later helped design the original TRON for Disney) and Phillip Druillet. Those comic greats' involvement has, of course, been completely overshadowed by the stylistic contribution of Swiss surrealist of macabre tech, H.R. Giger. The decidedly unoriginal monster-on-the loose plot (showing unmistakable influences of the HALLOWEEN slasher formula then current) has a group of blue-collar astronauts aboard a vast, deep-space refinery-ship diverted to investigate a derelict spacecraft of nonhuman origin. Soon their gigantic craft is invaded by a fast evolving, ferocious parasite creature with acid for blood, whose Giger-esque biomechanical shape allows it blend in fiendishly with the ship's labyrinthine tubes, wires and knobs, to pop out from the shadows and seize the dwindling cast. Though the alien of ALIEN has since been overexposed in crummy sequels, toys and comic books (even Superman fought them), the alien was kept largely in shadow here. Another great gambit used by Scott was shooting much of the picture claustrophobically, with a shaky, hand-held camera in minimal lighting. It was pretty daring for the era, 20th-Century Fox not mandating that Scott perpetrate sweeping, Kubrickian f/x panoramas and interiors to compete with STAR WARS in the eye-candy and cute-little-robot sweepstakes (turns out that there is a robot among the crew, neither little nor cute). Sigourney Weaver's final pursuit through the self-destructing ship anticipates THE BLAIR WITCH PROJECT as one of the screen's better expressions of sheer, visceral terror; I myself did find the whole series kind of lost its impact when her Ellen Ripley sole-survivor character went G.I. Jane commando in the James Cameron sequel ALIENS. You'll notice the picture is pretty perfunctory about what exactly the alien is doing with its squirreled-away victims. I was given to understand that MPAA and studio suits thought the notorious idea/image of these parasitic larval things bursting out of human hosts was the cutting edge of sickening/distasteful, and some ghastlier stuff got cut because the Hollywood folk didn't want to make a habit out of it. Later, when aliens were fighting Predators, it became practically a PG-13 gimmick for the kids watching.